It shouldn’t have to be like this, right? Meet the rediculously simple 1-step application delivery in Scense. Scense delivers, configures and manages applications, throughout the entire landscape of physical and virtual desktops, laptops, terminal server sessions and non-domain computers. The user gets a personalized workspace with applications, settings and data wherever they decide to logon. Powered by the Scense runtime system, applications can be (re)configured in real-time, any time. Whether you choose to install applications on-demand, when a user clicks a shortcut, or up-front in your golden image, it’s all simple and straight-foreward. Scense Application Delivery seamlessly integrates with Live Profiles, Software Metering and the Service Point. 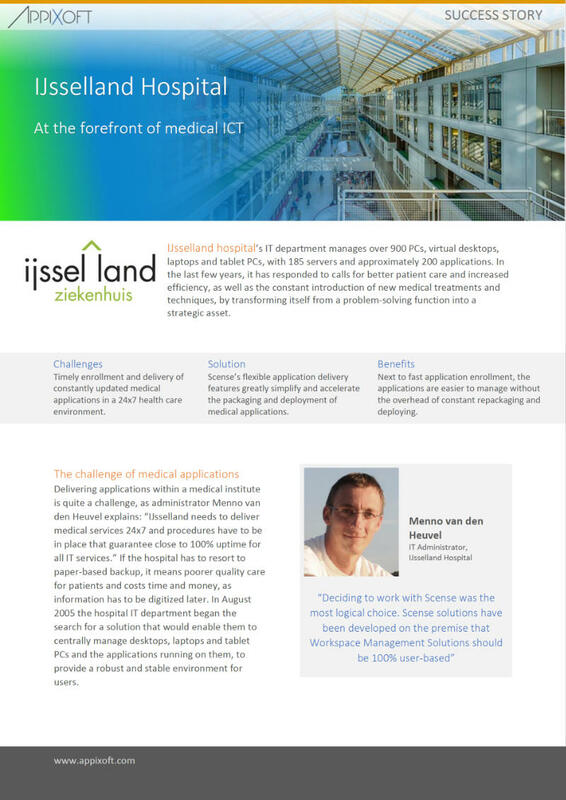 See how Scense Application Delivery saved IJsselland Hospital a lot of time. Resolve application conflicts on-the-fly unattendedly, without the need for repackaging or sequencing. Deliver conflict-free applications in any environment, even BYOD. Layer the applications in your VDI golden image by using the Scense runtime system. Gradually add the right company-, department- and role apps to persistent and non-persistent workstations. The incredibly flexible application dependency feature will automatically install any necessary components. It even handles a mix of conventional and virtual applications. The traditional idea of application delivery dictates that a user should never be bothered by the technical specifics of an application installation, and we at Appixoft fully agree with this. However, today’s users are quite familiar with the concept of installing apps. They do it every day on their phone or tablet. So why don’t we let them in on it and give them the tools to be self-sufficient without actually having admin-rights? Scense allows for just-in-time installations where applications are only installed if a user clicks a document or shortcut. The Scense Client allows users to re-install applications whenever necessary, and the Scense Service Point enables users to add or remove applications to or from their personal workspace.